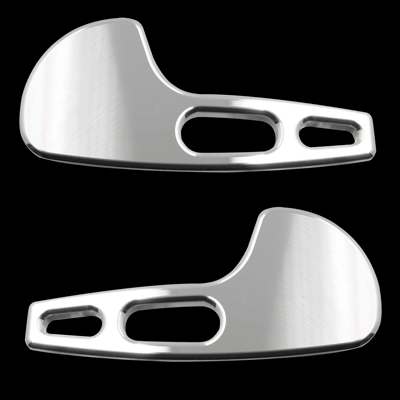 Innovative Bold Styling: Upgrade the look of your interior with UPR's Billet Aluminum Door Handles with cutouts for your 1994-2004 Ford Mustang. Replaces the stock factory door handles for a great look as well as fully functional. Quality Construction: Crafted from Billet Aluminum and designed to replace your factory plastic door handles. No one else can Stack up to the bold clean styling of our aftermarket Billet / Stainless Steel Dress Ups, Street / Strip / Racing Suspension and Performance Parts for your American Muscle Car like UPR Products! Installs in an hour and includes required hardware. Click Here for Instructions Fits these Vehicles: 1994 1995 1996 1997 1998 1999 2000 2001 2002 2003 2004 GT GTS Cobra Bullitt Mach 1 Mustang Steeda Roush & Saleen Vehicles. Made in the USA!